No one wants to receive that dreaded note home with your child from school that there is a lice outbreak in their class, or worse, that the teacher or nurse found lice on your child’s head. Every single year, more than 6 million children in the US alone get lice. 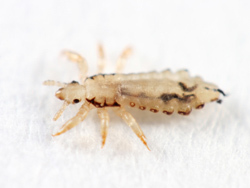 Lice are tiny parasites that spend their life attached to the human head, feeding on human blood. Lice is extremely contagious and can spread quickly both at school and at home. If you are concerned that you have a lice problem in your home and have not been able to completely eliminate the problem yourself, it may be time for a professional pest control service to help. Eco Tech serves the Minneapolis, MN area and can come into your home and safely and thoroughly treat the area for lice so that you can feel confident that you have eliminated the problem once and for all. Lice is spread from person to person and can be difficult to completely remove because of the size of the bugs and the fact that they lay their eggs quickly and new bugs can hatch daily. There are many over the counter and prescription treatments available to treat lice on you or your family’s head, including shampoos and body washes, but when you think that lice may still be on surfaces in your home, a professional pest control service can help. Our team has extensive experience with lice removal as well as the removal of other pests including ants, roaches, beetles, crickets, fleas and spiders. Eco Tech understands that you want to feel confident about the services you purchase – so our team does not require contracts and our prices are some of the lowest in the industry. Our professional pest control team is honest, reliable, on time and easy to communicate with and will locate the source of your pest problem and quickly come up with a comprehensive plan to fix it. We will also ensure that your property is repaired so that you are not vulnerable to the same problem again. Eco Tech also uses all-natural solutions for insect control for residential and commercial locations. This means that our services target only the pests — and no kids, pets or the environment will be harmed with our treatments. So, if you find yourself battling lice in your home, do not delay. Call Eco Tech at (612) 237-8282 and our team will respond quickly and handle your problem immediately!